I have enjoyed looking at the photos and quotes published by Garden & Gun magazine this month — advice that fathers have given their children through the ages. Some are seriously good and some are terribly funny! An especially nice sentiment — and I found that it’s originally attributed to Alex Haley. 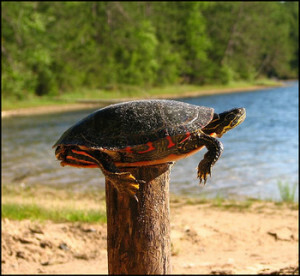 I’d never heard it before today, but it appears that I am the last person on the planet who did not know about the hapless turtle, given the dozens of illustrations that appeared on a simple search. When I first read this quote, I thought of the glass half full. Meaning, everyone could use help to be successful or happy. However, the more I looked at the poor turtle in this image — the more I felt sorry for him. He does not deserve to be stuck on this post! Someone “helped” him to get in this situation? How mean. I have never understood what hippies of the 1960s meant by saying that they needed to find themselves. Huh? I have always known that I was right here in my own shadow. So, I like the fact that this father was going to give a heave-ho to an offspring who needed to “find himself”. 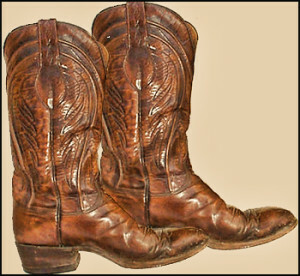 My father would have gently ‘encouraged’ me with well-worn but nicely polished pair of Lucchese’s. What I wouldn’t give to sit and watch him shine his boots just one more time.